I felt bad leaving out my international readers. So, I am adding one more prize to the giveaway - Dream Orient 36 x 46 Fat Half Yard. This would be perfect for a baby or wall quilt. For the draw, I will pick winners from 1 international entry and 3 U.S. entries. So, now this giveaway is open to everyone. The original post has been updated, click here to enter. I cut some FQs this afternoon from my Everyday Party Bolts. Yikes, yes its bolts. Isn't it fun to see these fabrics on bolts? 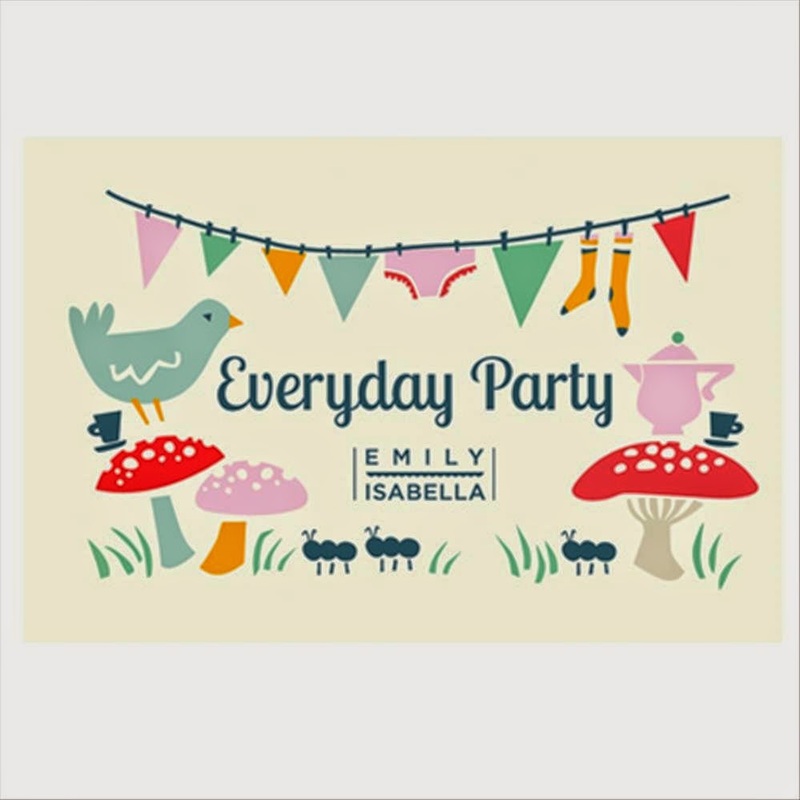 I am so glad that I added the two more prints from my original plan, the first one from left the "Everyday Party Ant March" and the 4th one from left "Everyday Party Mushroom" prints. 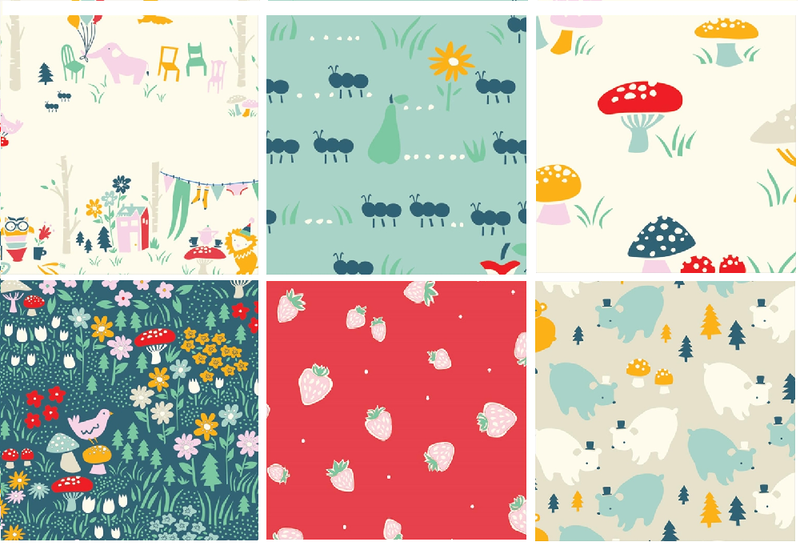 Here is what I will be cutting into tomorrow to make a baby quilt. I know I have other big WIPs which I need to finish. But they have one or more complexities associated with. Since I haven't been sewing on regular basis, for good 3 - 4 months now I just need some instant gratification. A quick baby quilt Remember my Tumbling blocks quilt from the LQF, I am making a baby version of the same. It was a fun quilt to put together. There is still time to enter the Quilter's Dream Batting giveaway. Check this original post for more details, click here. 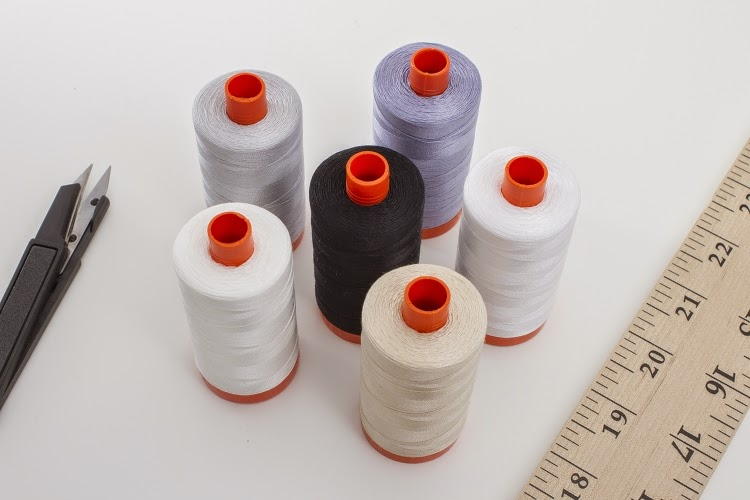 I am really excited to host the Quilters Dream Batting giveaway. 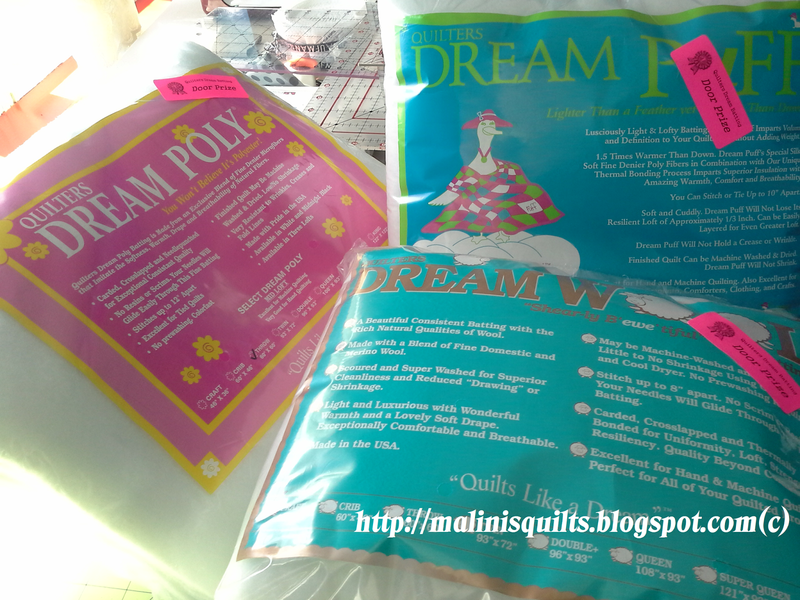 I have 4 prizes from Quilters Dream Batting for the giveaway. Three of my luck readers get to win these prizes. Details are below on the Rafflecopter widget below. 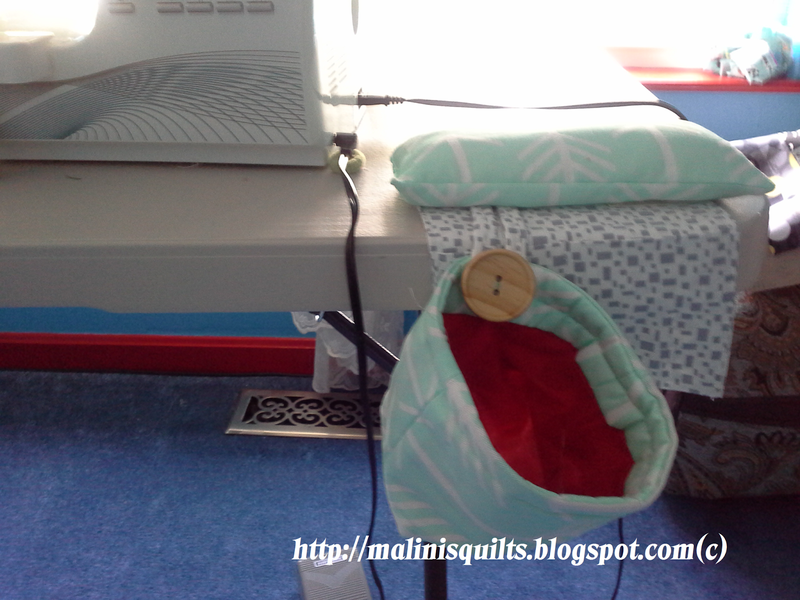 If you need some sample email E~Mail Quilters Dream. They will be happy to send you some samples. The first winner will get to choose which batting they would like and then the second winner gets to choose from the remaining. UPDATED: The giveaway is open to all, I will pick one winner from international entry and 3 winners from U.S. entries. Spread the word and get more entries for yourself. Pincushion, thread catcher set It was just wonderful to receive an handmade gift. Stephanie did a great job choosing the fabrics I liked :-). Totally thrilled! The snack which she liked is the store bought one which I bake it the oven ;). Shopping Spree Bits N Pieces is open till 5pm, you still have time to shop. To checkout their Mother's day sale, click here. By the way, we also rescued a turtle crossing the road. While I stopped the car and blocked the road. And was thinking of getting down to pick up the turtle, wasn't sure if it will snap me or not. A nice lady from the car behind me did the heroic act and helped the turtle cross the road. Went spent Mother's day isn't it :-)? 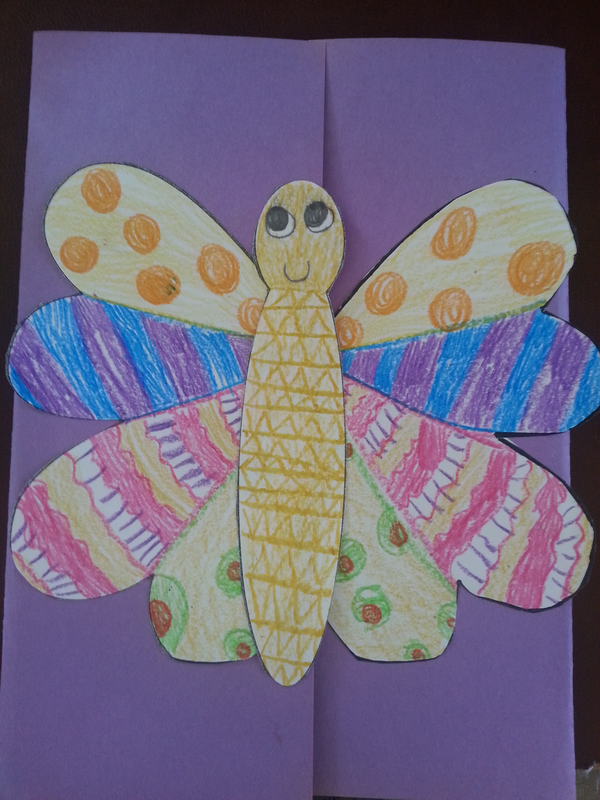 How are you spending your Mothers Day? Happy Mothers day to all the mothers out there. To celebrate all orders in the shop over $50 is 20% off, Use coupon code: 20OFF. The coupon code expires 5/18/2014 at midnight. So, I will just let you use this coupon for the batting too. The listing for batting will be available tomorrow afternoon around 4pm. I am really excited to share the news that Malini's Quilt Co. is an official business in Massachusetts :-). Yippie! Skippie! I am not sure what this means or where its going to take me. But just wanted to explain what my main goals are. My main goal of the company to is to sell modern quilt patterns at both Etsy and Craftsy through their instant PDF download. Since, I already had a Etsy shop, it will be easier to get started there. Craftsy, I would have to figure out how I can upload my patterns once I have my shop setup. I hope that is pretty soon. I will be slowing down on accepting custom orders for baby/toddler blankets and quilts. 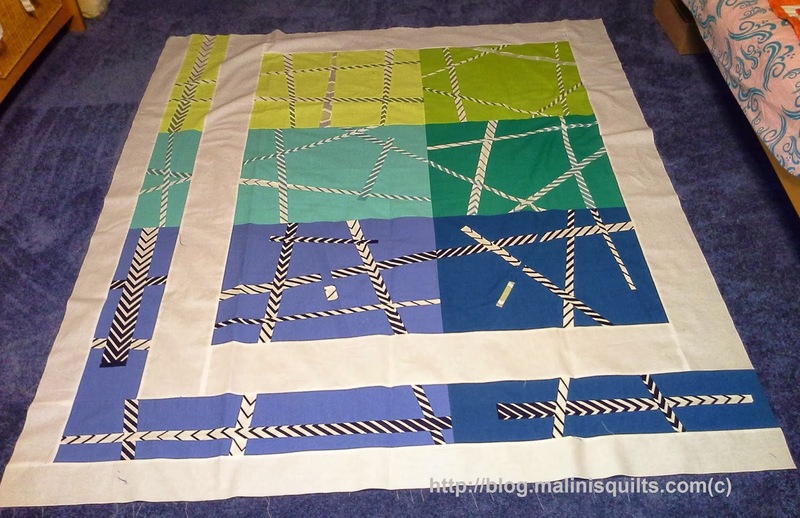 I might still sell some of the quilts which I make to test out my patterns. So, keep an eye on it.